The first loco in the collection came about after Rob became interested in the sugar cane railways of Queensland. “Mountaineer” was built to resemble a Baldwin bogie loco seen during a visit to the Bundaberg Sugar Refinery. This loco has now travelled over 2800kms mainly around the Halswell track. It uses a 4 stroke engine with an Eaton hydrostatic drive to all wheels. After considering the best and most efficient drive system Rob has settled on this arrangement for all his locos. These use a continuous chain around both axles of a bogie, then extend the chain up over a lay shaft sprocket at the top directly above the pivot point. The vertical chain lengths allow the bogie to pivot very easily. The next loco built was the French Bo-Bo shunting loco. It is painted and lettered in the green Fret colour scheme. This loco is affectionately known as “Kermit”. Rob’s next effort was a shortened version of a “Genset” loco in UP colours. Then came the Galloping Goose No. 2. Galloping Goose is the popular name given to a series of seven railcars built between 1931 and 1936 by the Rio Grande Southern Railroad (RGS) and operated until the end of service on the line in the early 1950s. 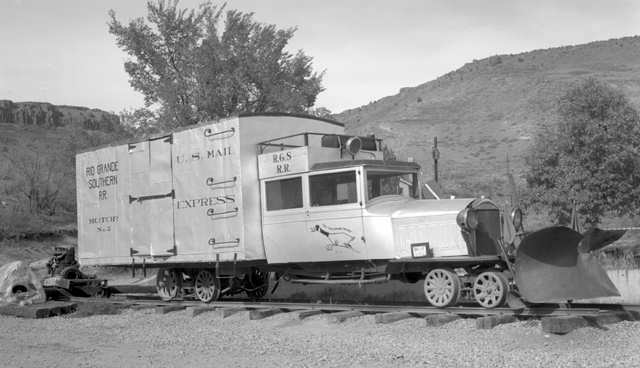 Originally running steam locomotives on narrow gauge railways, the perpetually-struggling RGS developed the first of the "geese" as a way to stave off bankruptcy and keep its contract to run mail to towns in the Rocky Mountains in Colorado. These were not only less expensive to operate, but were also significantly lighter, thus reducing impact on the rails and roadbeds. This cost saving meant that the first Goose was paid off and making a profit within three weeks of going into service. 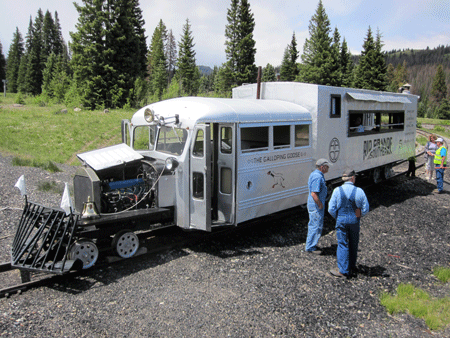 RGS devised the railcar using Buick and Pierce-Arrow automobiles or bus front ends and a box car rear end. Seven Geese were built and all but one survive today. Goose No. 2 is at the Colorado Railway Museum. They were serviceable and definitely fit for their purpose. Traveling through the countryside with a horn that could easily be mistaken for the call of a real goose, they were said to have “waddled” down the uneven, poorly maintained tracks of the cash-strapped Rio Grande Southern thus gaining their nickname. Rob researched the original and found scale drawings and copious photos resulting in a very nice, albeit unusual, 1/5th full size scale model. This loco drives only the rear wheels under the freight box. Rob says it really is “something different” and is a lot of fun to drive and see running. Construction follows Rob’s usual approach with the outer skin 0.9mm zintex sheet pop riveted to the frame after the panels have a bead of glue inserted where they match the frame. This takes the vibration out of large panel work. The drive system also follows Rob’s usual pattern. The rear drive axles have the outside chains and sprockets fitted as per the original, but they serve no drive function as one sprocket is free to turn on the shaft. The side door on the RHS of the box opens to allow motor starting and the roof is hinged at the rear to facilitate re-fuelling and service duties. The Goose is driven from a 4 wheel car that has the wagon (car) brake compressor, tank and controls fitted inside. It will easily pull two club passenger wagons. The snow plough is a distinctive feature. Rob rolled it out of 3mm plate over an old fire extinguisher in a bench vice. The bell was found in a souvenir store on a holiday to the West Coast. The front working headlights are cut down motorcycle indicators with a pleasing yellow colour and the roof mounted headlight is an LED torch. Rob’s latest loco is again a cane loco but this time rather than another bogie loco it is an 040 Comeng design. This is also built to scale using drawings off the ‘net. This loco is only 4 wheel drive so Rob has deliberately made it very heavy. It has wide flange wheels cast in SG Iron from a club pattern. The loco is very powerful and can easily pull 3 fully laden passenger wagons. This loco is lettered and numbered for its home, the now defunct Fairymead Refinery in Queensland. Rob notes the invaluable assistance received from several club members in constructing his locos. Next project: a Swiss narrow gauge diesel. Some Images of the Real Galloping Goose and one of Rob's model - spot the difference?